The city of Agoura Hills is located in LA County, California. Besides having a population of over 21,000 people, the city is also flocked with artistic and well built houses that give it its enchanting beauty. ​Nevertheless, natural elements like dust, bird droppings, and soot specs from factories make windows untidy thus necessitating the need for Agoura Hills Window Washing. Don't you always wonder how professional window cleaners clean your windows so fast and so flawlessly? Well, the secret is a combination of specialized industrial training on cleaning and various tricks that reduce the time needed in an efficient manner. These tricks are so simple that you can learn and clean your windows on your own. Here are the steps you can follow during Agoura Hills Window Washing process. And ample amount or water for cleaning. You will get these items from any Hardware or Cleaning Store. Be careful while selecting the Squeegee. Ordinary Squeegee is available at a very cheap price but their quality is almost negligible. Always prefer a Squeegee which has a fine rubber blade with a replacement. Do not compromise on the quality of the sponge at all. The conditions under which you clean your windows should be taken care off. Avoid working in the hot sun as heat can work against you and spoil the clean window. Wash the window on a cool or cloudy day or in the morning. Steps For Giving Your Window That Squeaky Clean Gleam! Mix 2-3 tablespoon of plain ammonia with a bucket of warm water. Start with scrubbing the windows with a wet sponge till it gets clear of all its rough patches. 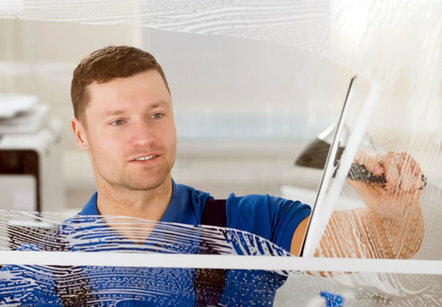 Presence of rough patches on the windows indicate that the surface needs a little more of a scrub. The unclean window usually looks cloudy. Next, use a dry rubber blade on the squeegee. Take the squeegee and place it on top of the window and pull downwards smoothly. Repeat, if required. Always dry the squeegee blade between each swipe. The cleaning process is almost complete. Now, it's time to clean and dry the edges of the window. Wrap a cleaning cloth around your finger and rub the edges. And there you have it! A clean and clear window!! A window that helps bring in the bright future! Check out our home page for more tips. If you cannot carry out Agoura Hills Window Washing effectively, or don’t have the time to do it, it’s advisable to get help from the experts in the industry. This will ensure that your windows have that winning sheen and last longer... much longer!! We also offer professional Simi Valley Window Cleaning services.